The common, tri-border regions of the Central European countries (Ukraine, Slovakia and Hungary) have similar geographical and economical features. The distance from the capital cities resulted in the local population seeking relations more intensely in all possible areas of life -economic, cultural, education, artistic. Making new economic relations was caused by the fact new borders were introduced following the World War I. National minorities were striving to maintain or re-build connections with their national states, since the secular traditions of economical and commercial collaboration were broken off. Carpathian Society of Hungarian Intellectual Workers, Uzhgorod, (Ukraine) 1993. The Carpathian Border Region Economic Development Association was established in 1994 by economic and business promoting branches mentioned above and that were already functioning in Hungary, Slovakia and Ukraine, with the purpose of fostering the recovery of the region's economy. Beyond providing direct assistance for the enterprises run in the bordering area of the founding countries. The CBED have been working on to draw western investments, upholding the admission of the "free market" principles among the economic participants of the countries involved. 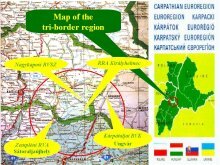 The Tri-Border Region Economic Cooperation Strategic Programme is directed towards an area geographically designated and includes the Zemplén region in Northeast Hungary (Bodrogköz, Hegyköz,), provinces bordered by Eastern Slovakia and Hungary (Trebisov - Mihalovce) as well as the Uzhgorod - Beregovo districts in Sub-Carpathia. It were enterprise development organizations that have undertaken to initiate communication with regions over the border, and by this to co-ordinate economic and region development programmes and even to elaborate complex development proposals. Springing from the features mentioned above, the CBED's entrepreneurs and regional development programs aim to promote the international collaboration among undertakings working within the countries involved by way of realization of distinctly outlined objectives. The most important aim, which makes up part of the Tri-border Economic Development Strategic Program, is to provide local enterprises with up-to-date information as well as to constantly convey alterations of laws controlling business activity to firms and individuals. A database, which is being continually updated, is set up to assist the administration of the potential clientele. It is available to enter in it for free of charge and on voluntary basis. The service is run with concrete demand for partner search by submitting uniformly designed registration forms to our offices. To achieve our programs we operate an office network, with a computerized database being at the disposal of enterprises searching for business partners. This is where we gather and disseminate all the current economic information that is considered crucial for making and maintaining external trading relations. Regularly organized international exhibitions and markets guarantee a wide range of opportunities to shape definite business relations and to locate further markets. In businessmen's meetings held simultaneously with the exhibitions, current information about economic regulations, legal and customs conditions is publicized for businessmen who come to attend these events. By he statements conveyed in the professional study entitled "Tri-border Region Economic Cooperation and Development", which was elaborated by the CBED, the economic cooperation among these border regions is restricted not only by differences in jurisdiction processes and rules but by several physical obstacles as well. The crossing points along the affected borders have greatly limited transport capacity, and in certain naturally adjoining areas they are not even built properly, thus being unsuitable for international transportation. The organizations joining CBED and the Council pursue explicit lobbying activity on appropriate governmental level and at governmental offices to coordinate and settle problems regarding transportation across the border. Organizing and integrating these closely related bordering business zones a s soon as possible can only accomplish the development of the tri-border regions, as they are to ensure the necessary sphere for achieving the economic union of enterprises and companies in the area. Enterprise zones have already been designated in Hungary - Zemplén and Záhony - and in Ukraine. Having been elaborated by CBED, its main objectives focus on concrete strategic sub-areas, which are meant to serve the development of the tri-border economic co-operation system in a co-ordinated way. To operate information offices in each of the three countries. a három országban. To provide entrepreneurs interested with up-to-date information in the Carpathian tri-border regions: business proposals, supply and demand intercession, and information provision on law. To organize entrepreneurial exhibitions, markets and international businessmen's meetings to foster the shaping and development of partnerships as well as to set up potential markets and export-possibilities. To publish quarterly a multi-language newsletter containing economic and business information to make partner searching more effective. To broadcast a television programme with current economic information in each of the three regions monthly. To create homogeneous, consistent, entrepreneurial zones in the tri-border areas, harmonizing with the judicial forms, which are elaborated at varying levels for the time being. To proceed infrastructure and other region development programmes, to initiate the inauguration of further crossing stations, as well as informing local, county, governing and ministerial bodies of the absolute necessity of making those already existing crossings suitable for international transportation. To compile a unitary promotion publication in order to introduce the entire economic potential of the border regions, offering them for potential investors. Coordinated PR activity, to organize investment meetings. The Carpathian Border Region Economic Development Association has been performing its job, since its establishment in 1994, based on constant coordination between leaders of the founding organizations and Committee members. The schedules elaborated by the leaders of economic development foundations and centres for one-year periods are introduced to the Committee for consent. Besides the leaders of the founding economic development organizations, there are dedicated mayors and entrepreneurs from the region who take part in the Committee's job of designing and executing the outlined projects. Members also make attempts to gain support for the Association in their own countries, which means, first of all, providing information about the Association and its programs, taking advantage of their respective relations. To carry out the projects, there are regional offices collaborating in each of the three countries, where managing clerks and contributors are working on certain tasks. The mutual objectives are done jointly and are in accordance with the scheduled programme of the Association. The Zemplén Local Enterprise Foundation signed a contract with the Nagykapos Regional Enterprise Development Establishment (Slovakia) and with the Carpathian Society of Hungarian Intellectual Workers, on 4 November, 1994. In the framework of this agreement, we founded the Carpathian Border Region Economic Development Association to coordinate the region and economic development concepts in the three countries. There were several foreign organizations taking part in the process of establishing the Association and in elaborating its programs (U.S. Peace Corps, CESO ). We were given remarkable help from the small business development volunteers of the American Peace Corps working in Hungary, who have been actively participating in the work of the Zemplén Local Enterprise Foundation's assistance in accomplishing the program and in seeking possibilities for funding of the Association from September, 1993 until June, 1997. Raymond Patrick Becker provided daily practical assistance in implementing the program and in seeking for application opportunities from September, 1993 till September, 1995. Finacial support was provided by the CIPE (Centre for International Private Enterprises), the USAID and the EU Phare Program to start implementing our international regional programme. The possibility of making the Association as a model of interregional economic cooperation available for other organizations concerned in similar collaborating relationships was already dealt with at the time it was established. We also wanted to share the acquired experiences with interested organizations and local governments. Description and access to the Tri-border Region Economic Cooperation Strategic Programme provides opportunity for other border regions to elaborate their own development conceptions not only in Hungary, but also in other regions having similar conditions in Central-Eastern Europe. Rákóczi u. 18.,Po Box. : 8.